The following information is for the Microsoft Windows PC versions of our GroundSchool software. Unfortunately, due to restrictons placed upon us (and all software vendors) by Google and Apple, bundles are generally not available for iOS, Android, or Mac. You need to study for more than one FAA Knowledge (written) test, either at the same time, or in general. You purchased (or are thinking to purchase) one of our "Bundle" packages and want to get access all that that you paid for. Don't worry.. downloading the test groups you want and need is easy. For the purposes of this tutorial, I'll assume here that you want to get on your PC a "bundle" of Private/Recreational Pilot, Instrument Rating, Commercial Pilot, and Flight/Ground Instructor (this happens to be our "Takeoff Bundle"). However, the process is the same for any of the GroundSchool titles. The first thing you want to do is to download and install ANY of the titles that you are interested in. 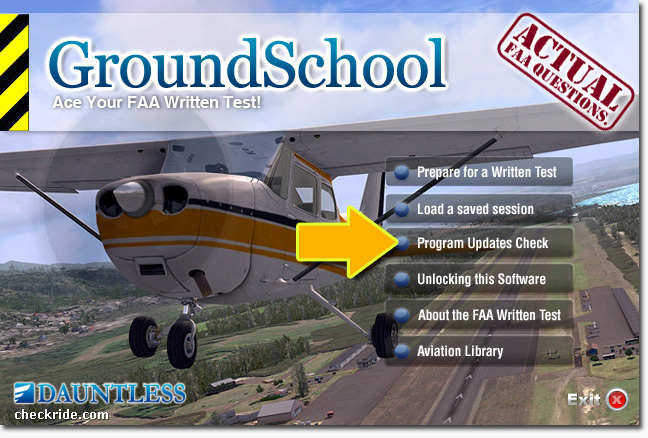 For example, here I've downloaded GroundSchool - FAA Private/Recreational Pilot. From the main menu, select "Program updates check." 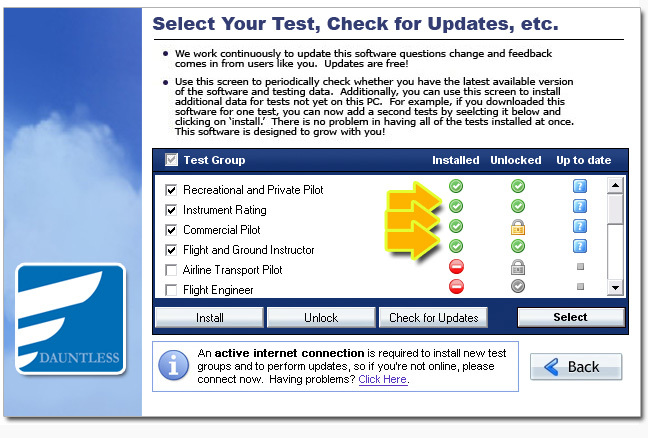 From the following screen, select the additional test groups that you wish to install and click "install." You can add as many as you like - even ones that you haven't purchased yet (ones that you haven't purchased yet will remain in demo mode). Once you click on "install", the desired groups will be download from our web servers. The speed of this download depends on the speed of your Internet connection and other factors. 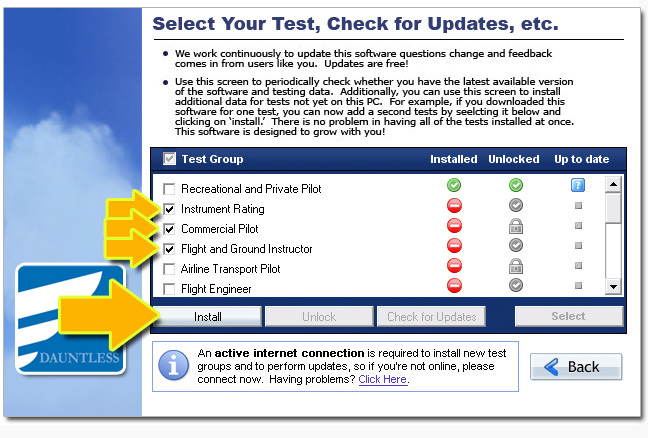 When the installation of the additional test groups complete, you can return to the main menu. Click on "Prepare for a written test." This will take you to the test selection screen. 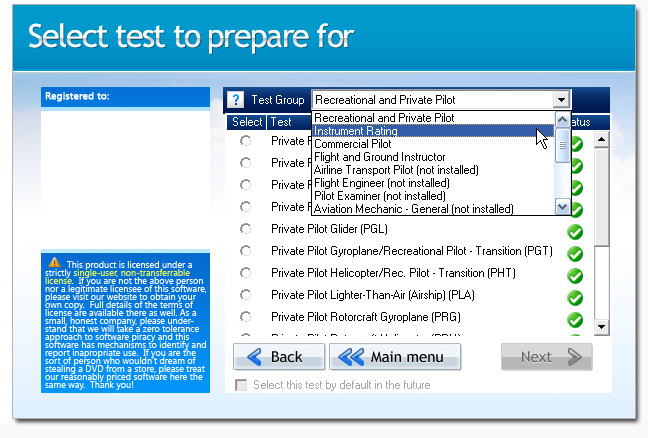 As you can see from the drop-down at top, you can select tests from the other test groups now too. If you have further questions, we're happy to help via our helpdesk.